Your on the wrong thread, this thread has nothing to do with the Gardner route? As to the "Y" at Clinton, there is no "Y" and never was one. What they had was two interchange tracks between the B&M and the NH. One interchange heading south on the B&M went right thru the edge of a mill building up a ramp to the NH heading towards Fitchburg. The other comming north on the B&M went right thu a small yard up anothe ramp and connected to the NH heading back to Framingham. There was no direct connection going south from Fitchburg to Clinton and then south on the B&M this would have to be a switch back and run around move. In the past to do that routing you would go south from Fitchburg to Prat Junction and take the connector track thru Sterling and then connecton with the B&M on the other side of Sterling but this would bypass Clinton. To put a connector in Clinton to connect the two lines for a connection you would have to take land and move a cemetery. That line is long gone and the origional road bed is almost non-existant. I beleve this connection was abandon back in the 30s. I can't, so I won't speak for anyone else, but I will ask if you are the same KEN PATRICK who was against raising Northern Tier standards in the Commonwealth to 286K because of cost. If you are the same KEN PATRICK, how do you deal with the inconsistency of calling for one cost-saving while arguing for the PW Gardner Branch to be upgraded to a commuter branch? If you urge sensitivity for the residents of Westminster, where is similar sensitivity for the residents of Holden, Princeton, and Hubbardston? Unless and until major money is spent on reestablishing double track between CPF-335 and CPF-345. Without demolishing some business along the ROW in Gardner, the seems no place for a layover facility. There also seems little place for parking. The planned Wachusett intermodal node and Westminster layover facility address those concerns, although not to your liking. "Watching trains is better than smoking meth." --Source, location, and time undisclosed. Forget it, he's just trolling. None of that word salad is intended to make any sense, nor is any rational response going to register. We can't even continue what started as a very interesting 286K Infrastructure thread in the NE Railfan forum because the thread****ting got so bad. There's 3 pages of jokes about Peeps Easter candies on it so the participants could keep sane amidst the shouting with a little lighthearted whimsy. the isolated, fallow parcel in gardner- north of 2, east of the pw gardner branch and adjacent to pas would be a low cost approach for a layover yard. taking taxpaying industrial land in westminster is simply foolish. a connection to the gardner branch would create a cr loop for the fitchburg and worcester lines.similar in concept to the discussions re: framingham-clinton-worcester but far less costly. i submit upgrading the Gardner branch for cr would be trivial. KEN PATRICK wrote: the isolated, fallow parcel in gardner- north of 2, east of the pw gardner branch and adjacent to pas would be a low cost approach for a layover yard. taking taxpaying industrial land in westminster is simply foolish. a connection to the gardner branch would create a cr loop for the fitchburg and worcester lines.similar in concept to the discussions re: framingham-clinton-worcester but far less costly. i submit upgrading the Gardner branch for cr would be trivial. 1. Wrong thread or no relation whatsoever to the discussion...check. 2. Nonlinear argument = "no public monies"...check. 3. Address an honest question or counterpoint by repeating nonsensical first point...check. All we're missing are the non-sequitur math problems about carload rates. Can we get back on the subject this discussion is about Fitchburg via Clinton, It has nothing to do with the Fitchburg / Gardner line. Ken please stop hijacking other subjects to vent your opinion, please take this conversation back to the Fitchburg line discussion. MBTA ownership of the Central Mass. ends at end of track in Berlin, east side of former Bridge 32.22, Colburn Road, which was a roadway underpass. This topic is wandering off topic. One of two things can happen here, this can get locked or moved to the New England Forum if this isn't brought into a discussion about the MBTA operating this route. A couple of things I was thinking here. If you were to go from the CM to the CSX Line, the location where they cross has a stream right beside the CSX line. I'm not sure if there is enough room for the connection. Making the connection in Clinton brings up other issues too. All the bridges would need replacement, you would have to build a new Clinton pump station at the Wachusett Reservoir and then the line is completely gone at the Clinton High School. As a side note I would love to take a train the comes out of the tunnel and find yourself high above the Nashua River. As to Pratt Junction, it is now a rail trail for much of it. Apparently at some point the MBTA acquired the Coburn St to Fitchburg Secondary gap. I though the Mass DCR had a lease from the T on the whole line for a trail. Apparently not as the parcel at the end of the line is for sale. Here is the assessor's map. Look right in the middle of this map. The 17.72 acre parcel north of the ROW I believe has been for sale for quite a while. Perhaps it has sold and the new owners want the T's parcel for access. In any case, the Central Mass will never be able to be connected to the Fitchburg Secondary if the parcel sells. SpiderHill wrote: In any case, the Central Mass will never be able to be connected to the Fitchburg Secondary if the parcel sells. Take a look at the assessor's map. Immediately east of the parcel for sale, there's already a gap in state ownership where a residential plot cuts the ROW and has a structure poking out into the former ROW. I'm surprised they did that, and are now doing this too. I think it would be a wise long-term strategy to retain this property. Considering the elevation difference between the Central Mass roadbed and the Fitchburg Secondary at West Berlin, who'd want to connect the two? Anyone That would want to extend commuter rail to Clinton. I doubt the original allignment could be used again between rebuilding the trestle and how do you go through Clinton High School. I'd admit though, I'd love to ride through a tunnel and exit 60+ feet above the ground. But that will never happen again. This at least would be an option. The Central Mass restoration study in the mid-90's considered exactly that given proximity of the West Berlin/495 terminal stop in the study to the Fitch. Sec. It's only 2.5 extra miles. Of course they would not rebuild the trestle verbatim on the same trajectory as before and skip right over without any track connection. There aren't competing private railroads here anymore. They'd alter the final approach and do a (probably northbound/Clinton-facing) junction for future considerations. And probably lump it in with the original build even if the connection was non-revenue, because the system interconnections with Clinton Jct. in spitting distance and the T now having Worcester-Ayer trackage rights on the Worcester Branch makes that too obvious to not future-proof right up-front. It's moot, though. 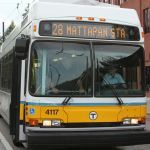 The study showed lousy ridership other than the Downtown Hudson stop because too many of the stop sitings are little Silver Hill-type oddballs off-center from the village "downtowns" of Weston, Wayland, and Sudbury with too little parking land, no local bus routes, and too few sidewalks filling that off-center mobility gap. And West Berlin parking sink just isn't a big enough draw to anchor it when you can spend a whole lot less building Framingham-Northborough on the Fitchburg Sec.-proper and net the same P&R on a more TOD-advantageous side of the I-290/I-495 interchange...and run a shuttle bus from Downtown Hudson to that stop to satisfy that town's transit needs. Throw in the fact that if we ever want to get serious about the N-S Rail Link the thru schedules are going to be a lot more mainline-centric on the northside in order to counterbalance traffic loads fed from the more sprawling southside. Expansion priorities will just be the obvious linear extensions along the mains into NH, and Peabody/128 getting its rightful Indigo schedule anchor. Infinite branching potential the likes of which would put the Central Mass on the board as a serious possibility just isn't going to be in the cards in a Link'd up future. Probably not the Manchester & Lawrence either, since I don't know how you could ever cram an extra branch through all that unexpandable Andover congestion when all other traffic is going to quickly spiral up, up, up to the limit of that reinstated double track.